There are many aspects of landscape photography that appeal to me. However one of the things that appeals to me most is the ability to capture a fleeting scene that will never, ever happen again in exactly that same way, and then sharing it. It’s recording stuff that you see with the naked eye and letting others see it too. Because nature is awesome and we have a nasty habit of taking this planet of ours for granted. And over the years I’ve photographed some cool stuff – comets, meteors, eclipses, super-moons, aurora, rainbows, moonbows, punch-holes, phantom falls, whales breaching, sea-eagles fighting, dolphins cruising – I even came close to photographing Kim Kardashian on one occasion. 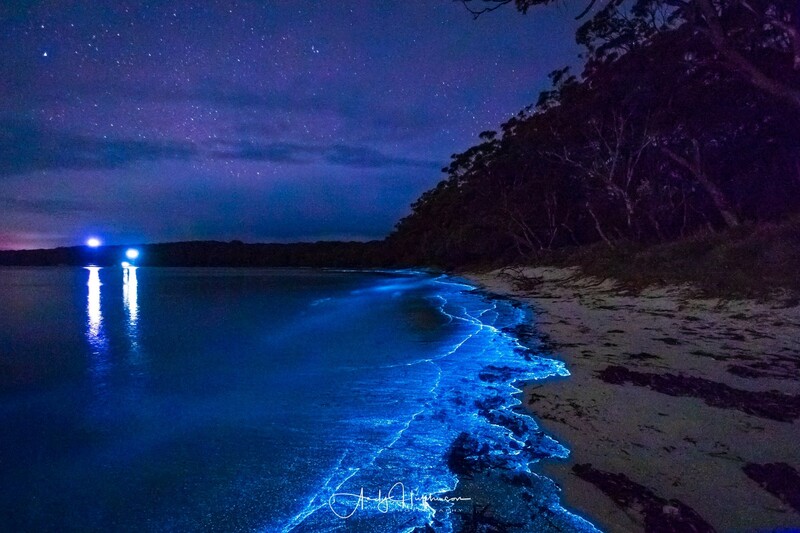 But of all the cool things I’ve photographed, bioluminescence is definitely my favourite. 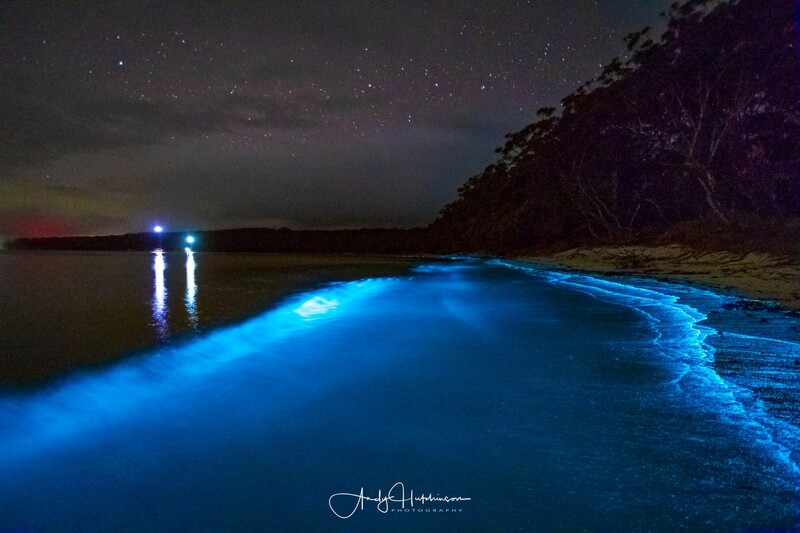 So, word reached me that there had been a big bloom – a red tide – in Jervis Bay. There has been a tonne of bio about lately, all the way down the east coast of Australia and I figured it wouldn’t be long until we got a good hit in the bay. So when I saw the photos of the red plankton during the day, I was set on heading out and photographing it. Even better, my wife Catherine and my son Josh, joined me for the adventure. We headed out fairly early so I could photograph the sunset first and then we could check for bio. After a brief pitstop in Vincentia for fish and chips, we drove into Booderee National Park. 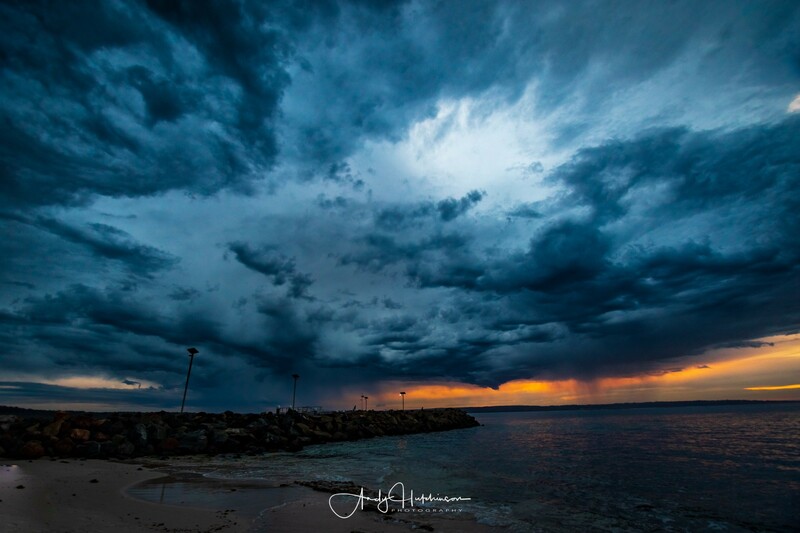 It’s storm season here at the moment and a couple of small storms were evident on the horizon as I photographed the sunset at Murrays Boat Ramp. After a moody sunset we got back in the car and drove around the corner searching for bio. By now the storm was very close but I convinced everyone we’d be okay and we walked down the bushtrack to the beach. 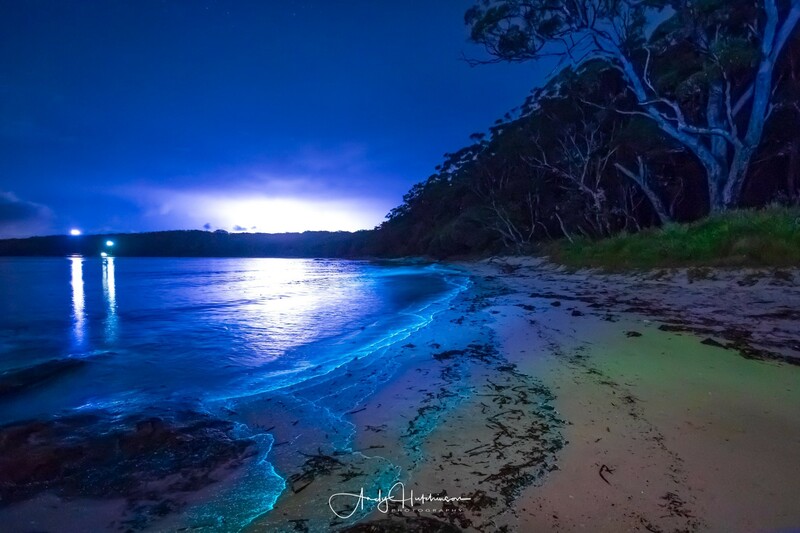 Unfortunately, just as we got to the beach and saw that there was indeed bioluminescence, there was a huge bolt of lighting, a big roll of thunder, and the heavens opened. We sprinted back to the car and sat, soaked to the skin, waiting for the storm to pass overhead. After a 15 minute wait, the skies cleared and we walked back down to the beach. 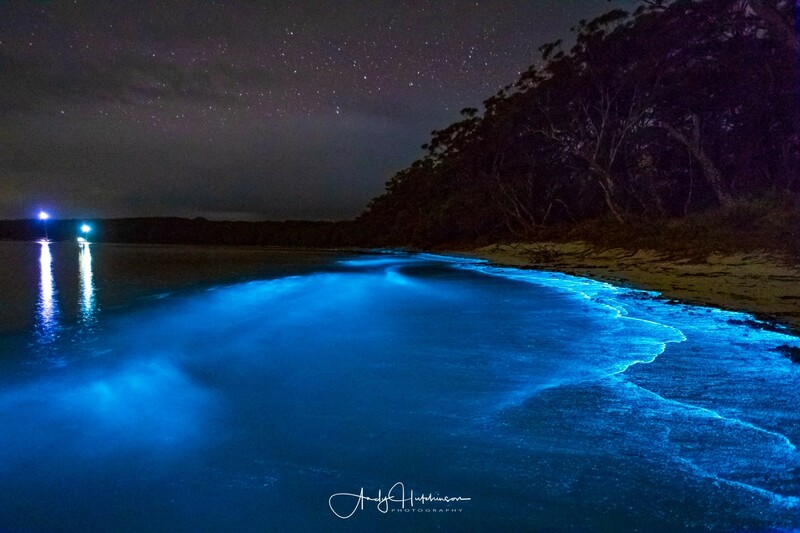 The bioluminesence was the strongest I’d seen it since my first sighting of it in 2014. 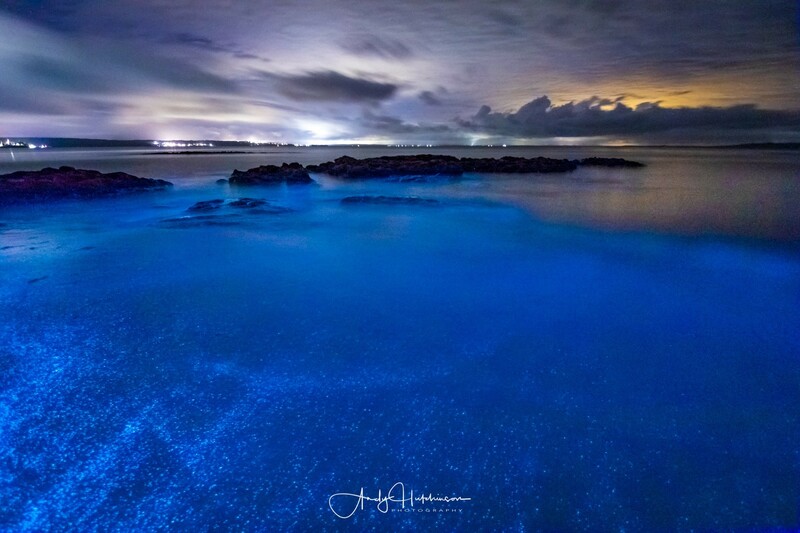 It was creating neon waves on the beach and had collected in the rocks on the water’s edge. It shone when you walked on it and if you put your hand in the water you got a neon bioluminescent hand. I photographed it for over an hour, before we had to head for home and left the beach to some other explorers who’d heard the rumours too. he storm that had caught us out earlier in the evening had tracked out to sea, but was still quite active. While I was taking this particular shot (a 30 second exposure), a huge fork of lightning burst through the clouds directly in front of me and briefly illuminated the whole beach. For some of the photos I took during the course of the evening I used my torch to light-paint the trees, but nothing like that was required for this shot. 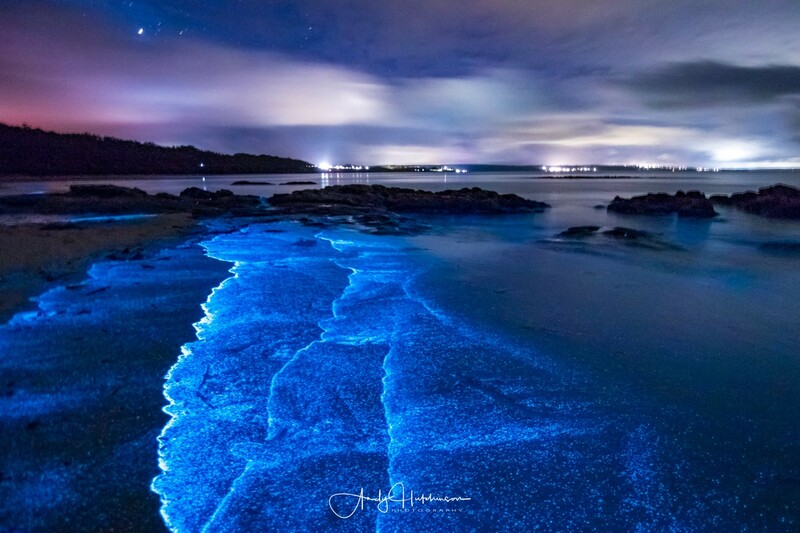 With the increase of membership of Facebook groups such as Bioluminesence Australia, there is a tremendous increase in interest in this natural phenomonem. 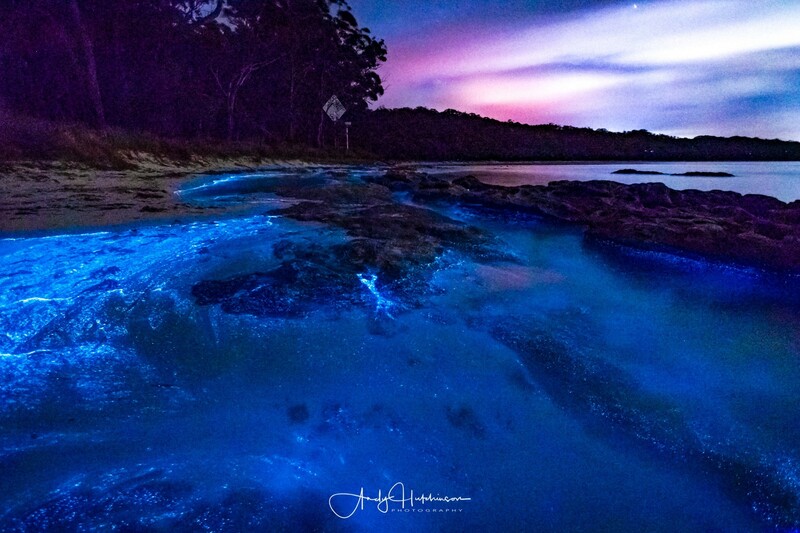 Some folks drove down from Sydney to Jervis Bay late last night to get a glimpse of this stuff and folks in Canberra were driving down to Eden for the same reason last week. 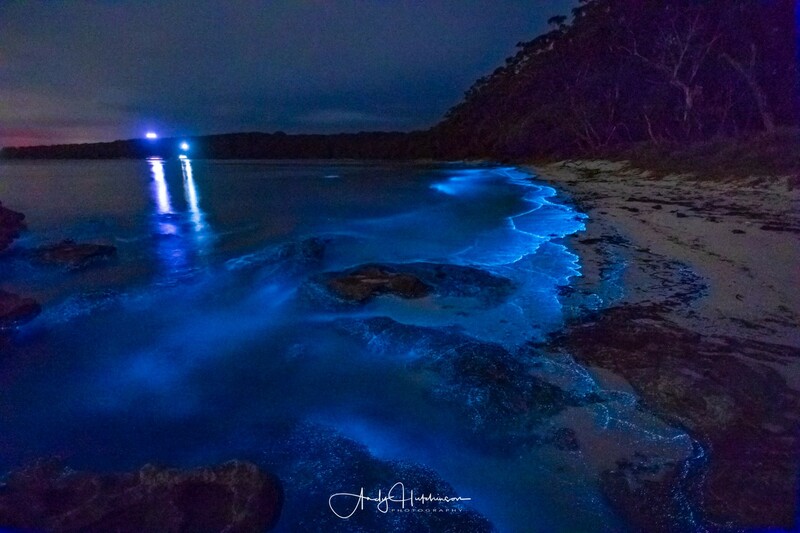 So I count my blessings that Jervis Bay is a short 30 minute drive from my house because it means I can go out and check out known hot-spots on a regular basis. There has been a fair bit of debate about sharing the location of sightings of the stuff and I do agree that it is a double-edged sword. On the one hand it’s great to share information about locations, but on the other hand, having several hundred people on the beach when you’re photographing the stuff does ruin the ambience (and the photography) to a great degree. Also, some folks tramp out and about in the great outdoors for months and months searching for bio with no success – and so you can hardly blame them if they keep it to themselves when it does appear. Happy hunting to everyone. 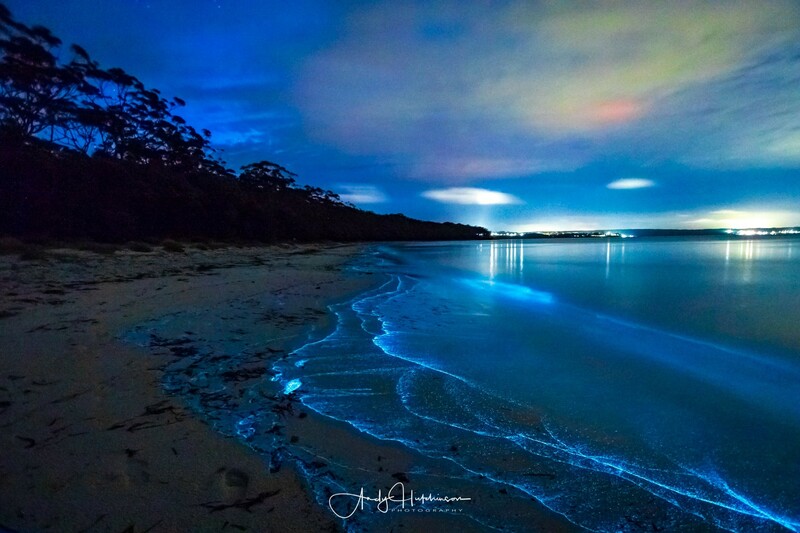 Jervis Bay is an official marine park and protected waters. It is home to some of the most picturesque beaches on the planet.